STRIKER wrote: Hey Con... I didnt know your Commodore 64's rotory phone dialup could go so fast. @LD, yes it is my home connection. Internet connection speed has never been a problem for me. Cox has been good to me!!! It's my graphic card and memory that need the help. Flying with 14 FPS is not exactly the most enjoyable thing to do!!! ha ha. Someday I will be able to upgrade. I just keep believing that it will happen. My ISP is bad right now. I phoned and have a service tech comming Thurs May 28th. I then asked if they offer a bigger pipe and to my surprise they do! Right now I have 5 mb and they offer 15 mb for an added cost. The 15 mb will be installed Thurs May 28th. I hope this will solve my connection problems. Till then, I'm not sure if i will be able to fly and stay connected. All this makes me wonder why I have a problem now? Did the ISP slow down my connection in order to get clients to purchase the new 15 mb connection? @Redeye, make sure they check your SNR level and also power levels both upstream and downstream! Upload is what really counts. Wow!! I hope to see that once too at home! Test during peak hours (8pm) here with Bright House cable: 29142kbps down, 1913kbps up. 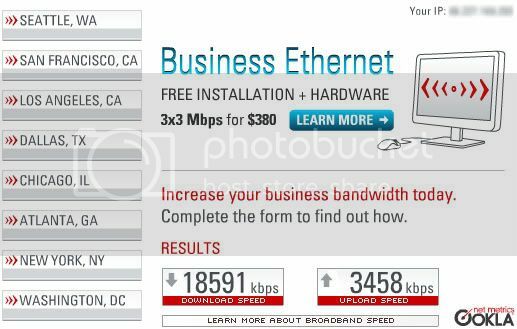 That HAS to be years old because now with Verizon and Comcast both using FiOS lines that puts us easily in the 30+mbps range. The chart shows average speed, not the fastest options available. The infrastructure in some of the smaller countries far exceed that of the states. Consider that almost every household in Sweden for example has access to fiber optics nowadays, compared to the most common packages readily available in the states (cable and DSL) is one factor, another is what most are willing to pay for. Most people aren't like us, and instead settle for the cheapest broadband solutions, hence why the US is far behind on average speed compared to other technologically advanced countries in Asia and Europe. T1, dude! I had one at my old dorms too, never a ping above 40. Sigh. Beaker wrote: T1, dude! I had one at my old dorms too, never a ping above 40.